…the department had expressed concerns about the ?formality ? of comments left on a blog post. This despite all of their consultation methods being ?free text? (email, post, web form, face-to-face meeting) and our consultation blog being split up to paragraph level. A separate, but related, issue was that the comments on the Big City Talk were (or could be) ?in conversation? with each other ? that was a problem for the consultation team. Once they had accepted the comments, there was a weird issue of the council signing Big City Talk commenters up to the Limehouse ‘consultation portal’ without their consent, something Jon rectified himself by putting all the comments under his own details. We are smaller than the structures around us. We inhabit the gaps the host matrix cannot occupy itself. Our small size gives us speed and responsiveness and though the sites we may occupy are ultimately determined by the host matrix, we are mobile and select which of the available positions we inhabit. Our host is rigid; bound to the other similar entities around it in predictable patterns. We are independent; we may cluster around locations or other interstitials, but our interactions shift as required. We frequently move on, jumping between adjacent sites. There?s no problem, it?s just how we are. Our host may regard us as defects, but though our numbers are small, our effects are wide-reaching and can drastically change the properties of the matrix we operate within. Some say the social media world in Birmingham is a clique. Well, I have to say it?s a very easy clique to break into. I don?t know where else a newbie like me would have been allowed to get away with quite so much. Too right. I don’t think I’ve ever come accross a network so supportive, I’ve had an amazing amount of help and would never have been able to half of what I’ve done over the past year without it. This post also made me aware of Jaki’s Women in Brum blog, God knows how I missed it before. I was very flattered to discover my name on the ‘Brimmin’ list! WXWM – The Brummie alternative to SXSW has a great venue and its own web page thanks to organiser-in-chief Shona McQuillan. On Saturday 14th March, WxWM will take place in the meeting room upstairs at the Kitchen Garden Cafe in Kings Heath. The venue has free wifi, you can purchase food when you?re feeling a bit munchy and, importantly, it?s licensed. I?m particularly pleased about the latter. We kick off at 3pm, with anyone wanting to come and set up their equipment able to do so from about 2pm. We?ve got the room until 8pm, and will attempt to sabotage Pete Ashton?s Texan experience via Skype at around 7pm. There have already been some fantastic suggestions for panels which I really hope will be firmed up soon, but do keep the ideas coming! It seems I’ve gone and volunteered to be a panel speaker and live blog at this, which should be interesting. Citizensheep – Michael Grimes debates the dilema of using friends’ expertise for free. This is something I’ve been seriously guilty of myself, both for Digbeth is Good and more increasingly for work, so it’s something I need to be mindful of. Michael’s also written a brilliant explanation of RSS – it’s a way to see your very favourite fish amongst the many shoals, apparently. Anyone who knows me or follows me on me on Twitter will know I’ve been pretty mad busy of late, what with Digbeth is Good and the various projects that are coming off the back of that, so the other week I met with Pete Ashton and put my life onto his huge whiteboard in an attempt to get it into some sort of order. 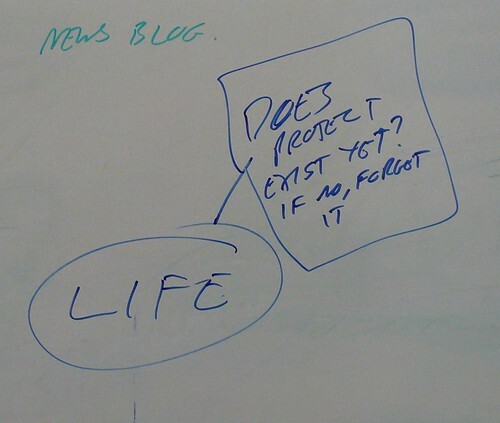 This bit of the mind map made me giggle – does the project called ‘Life’ exist yet? Not right now, it doesn’t. Pete’s answer to this quandry? 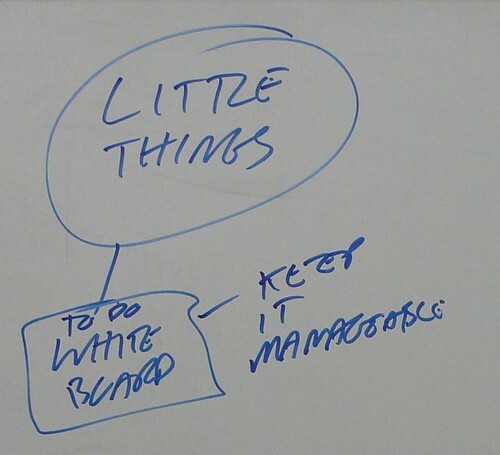 Why, buy a whiteboard of course, and get all those ideas and little jobs in my head onto a shiny, wipe-clean surface. Created in Birmingham – time to move on – An article by Dave Harte which has generated quite a debate – should CiB merely highlight local creative activity and facilitate a space for discussion around it, or should its editorial be more critical, opinionated and challenging? Kate Spragg has responded by letting us know her plans for CiB – we have a new theme and interactive Birmingham map of creative to look forward to. I personally think she has been doing a great job since joining in January. The CiB t-shirt competition made me think there will be some interesting developments as she finds her voice.